Manotick is a community first settled in the 1830’s located 30 km’s up the Rideau River. 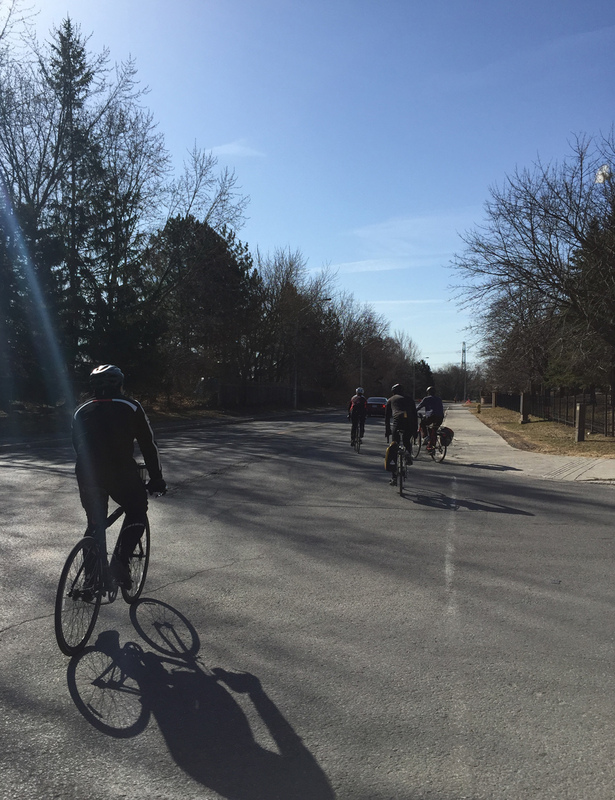 This past Sunday I and a group of fine people rode there. It was a great outing. Blue line on the following map shows how we got there. Green lines are variations we took on the return trip. Purple and orange lines are suggested minor deviations to the chosen routes. 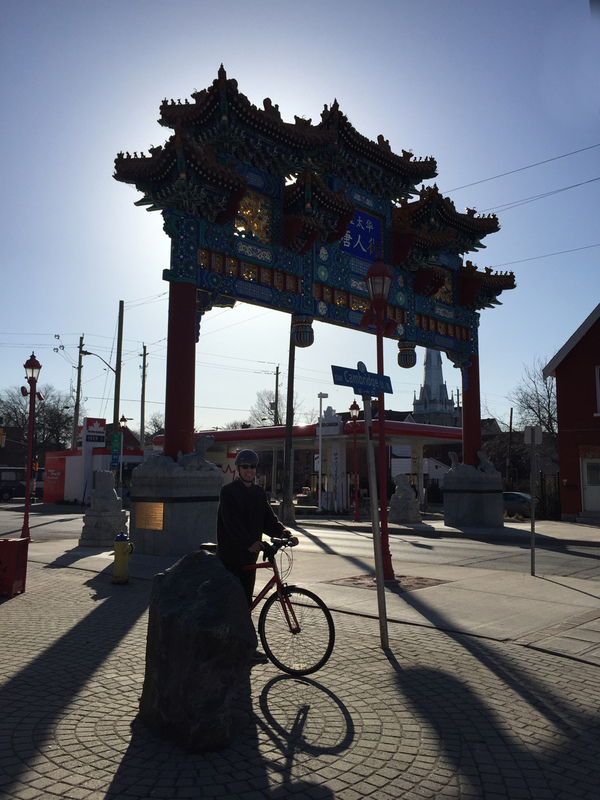 JP and I started off at 8:30 am from the Chinatown Arch in Centretown. 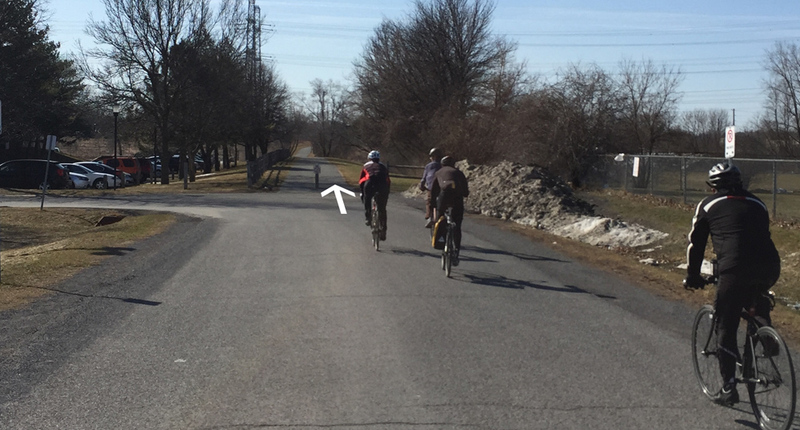 We headed down Somerset to get on the O-Train Path, over to Prince of Wales Drive, and through the farm before joining the Experimental Farm Pathway where we met up with three more riders -Glenn, Heather and Chris. We cut south from the Experimental Farm Pathway through a series of paths and streets to Capilano Drive, a more detailed description of which can be found within a previous post, by clicking here. We headed south down Birchwood off of Capilano and continued straight through back ends of mall parking lots, mostly empty on Sunday mornings. Link at end of Birchwood to mall parking lots. To avoid having to ride through the parking lot, there is also the option of taking the path up behind the parking lot, as suggested by the orange line on the above map. This path starts off as gravel before becoming a well trodden desire line that ends at Meadowlands Drive. A hundred meters to the right along Meadowlands takes you to the lights that leads across to Grant Carmen Drive. We then kept heading south along Grant Carmen Drive which had very little traffic, all the while avoiding crazy dangerous strip-mall Merivale Road, one block west. South of Viewmount Drive the road morphs into a multi-use path that cuts through to Colonnade Road. 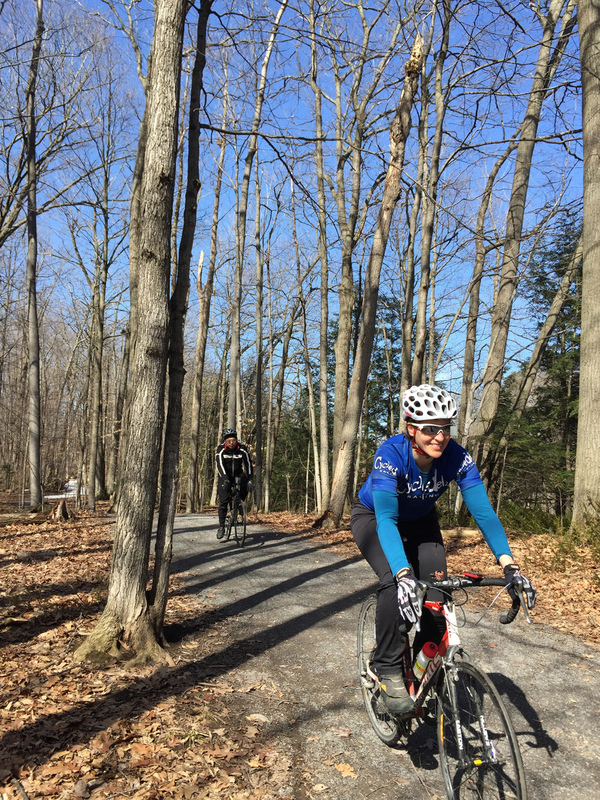 We rode along Colonnade road to Merivale Road. 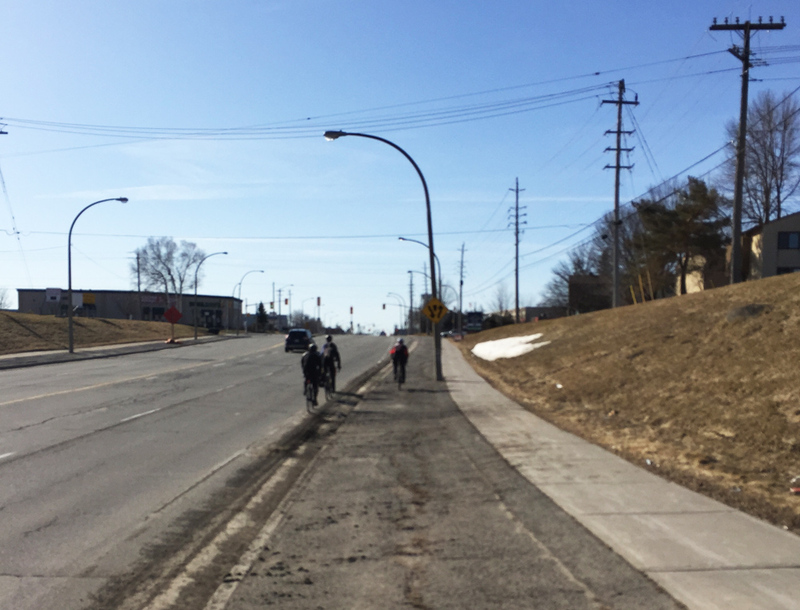 UPDATE – Fall 2015: A bike lane has been installed along Colonnade Drive between Merivale and the path – a huge improvement to the shoulder less section it once was. 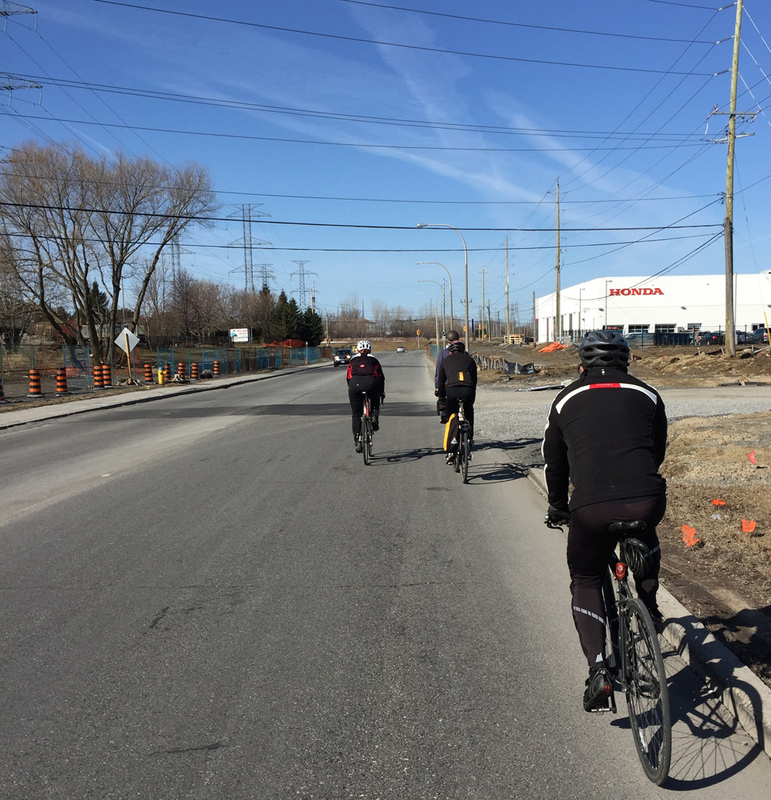 We rode along dreaded Merivale Road to get under the train tracks, however there fortunately is a paved portion between the curb and the sidewalk one may to choose to ride along to get to Woodfield Drive on the other side of the tracks. Just off Woodfield there’s a path that runs all the way west to the signalized Hunt Club Road crossing. 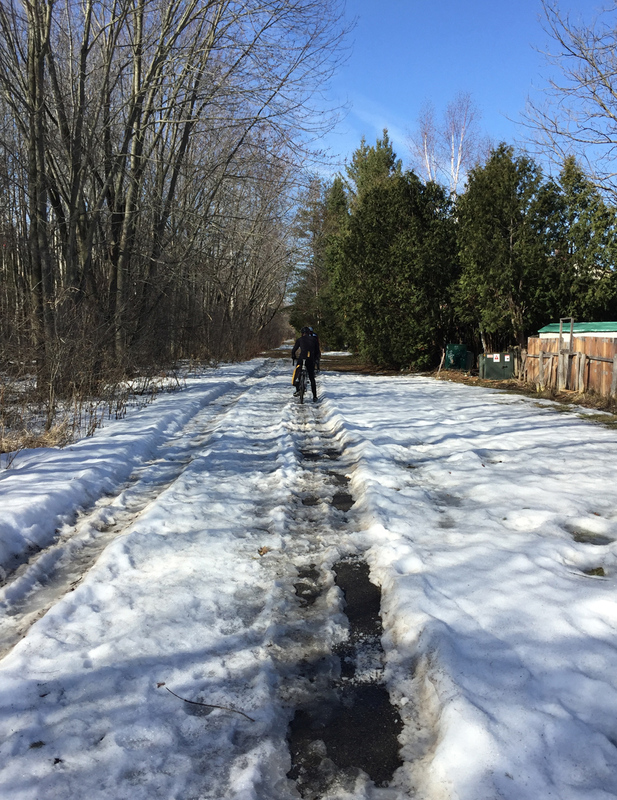 It’s a shaded path that isn’t cleared in the winter, so we encountered a few patches of slush and ice. 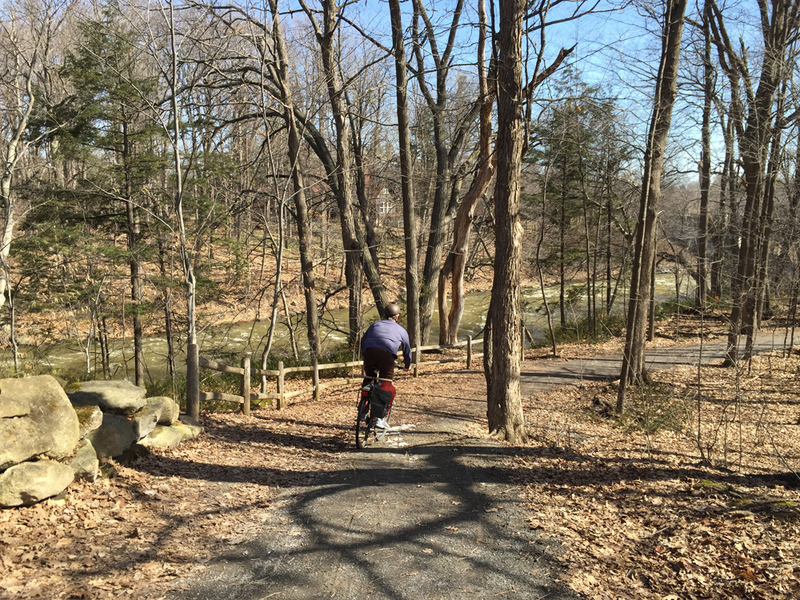 We decided to ride along quiet Benlea Drive that runs parallel to the path. The path continues behind the Nepean Sportsplex, then runs south along Woodroffe. The paths we followed all the way from the Sportsplex to and through Barrhaven were cleared all winter so no slush to worry about. 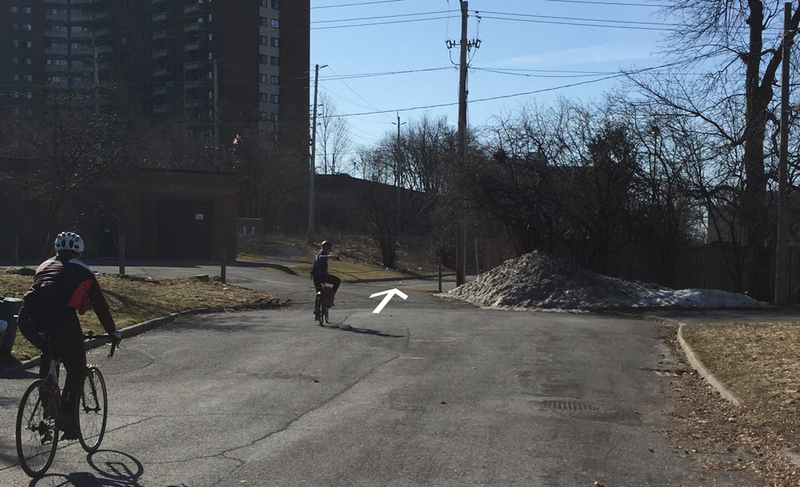 We crossed Woodroffe and continued along the path on the north side of Fallowfield Road for a short distance before crossing Fallowfield at Via Park Place. We got on to the path that continues southwest then south beside the transit way all the way to Berrigan Drive. Followed a road link between Berrigan and Strandherd Drive. Rode west on Strandherd, south on Greenbank, then east on Marketplace Avenue through the big box mall parking. East end of the parking there’s a short path link to roads that join up with the bike lane that runs along Longfields Drive. In retrospect I would recommend turning off the path and onto Longfields further north as suggested by the purple line on the above map, thus avoiding busy Strandherd, Greenbank and the big box store parking lot. 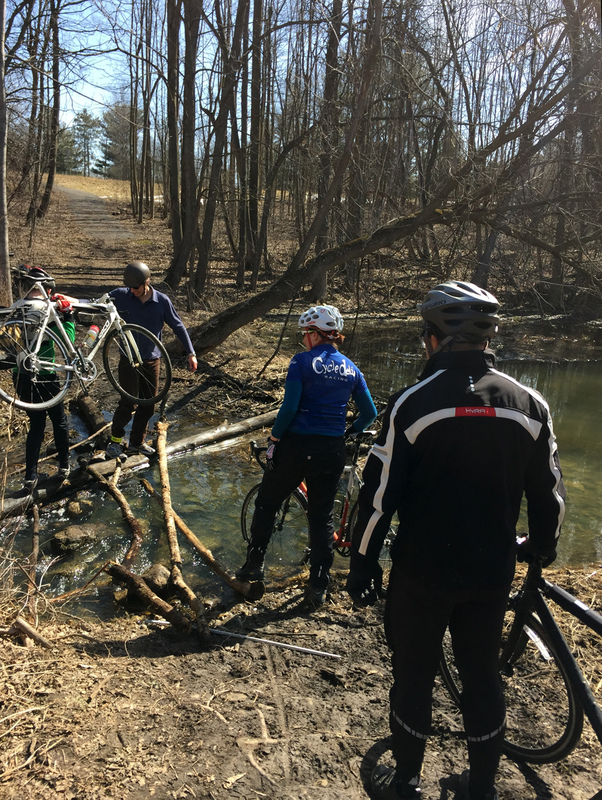 After riding down Longfields and crossing the Jock River we joined a gravel path that weaves it’s way in and through varied wooded areas along the shore the river. 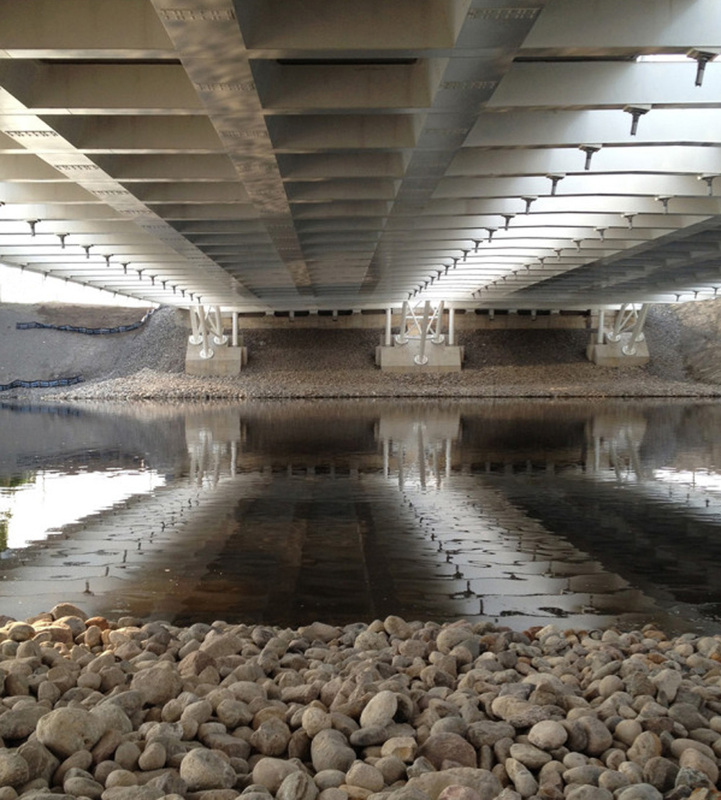 This path went under Prince Of Wales Drive and then continued along the Rideau River. We had to contend with a few remaining minor slushy and icy patches along the path but that just added to the sense of adventure. Bit of a challenge crossing the stream in Beryl Gaffney Park, but nary a soaker was had! 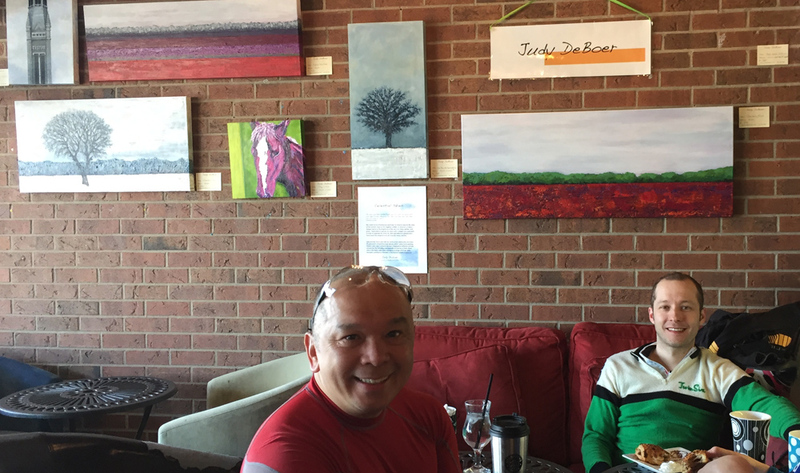 We rode along quiet streets and paths the length of Long Island, then crossed back onto the west side to seek out the French Café, where a colleague and friend of mine, Judy deBoer is showing some of her paintings. JP had to head back after grabbing a snack, while the rest of us settled down for a yummy treat and the biggest cappuccinos I’ve ever seen. 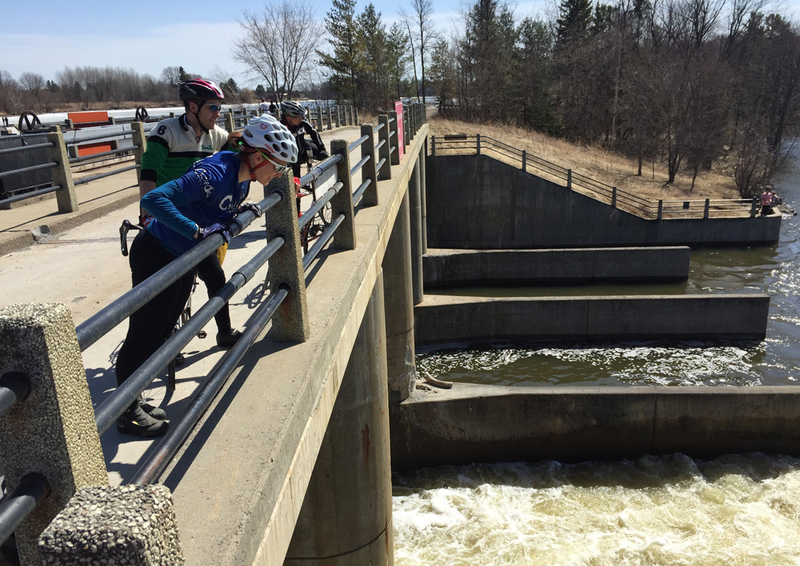 Heather plotted a great route for the return journey which included a short side trip that rode a local dam. 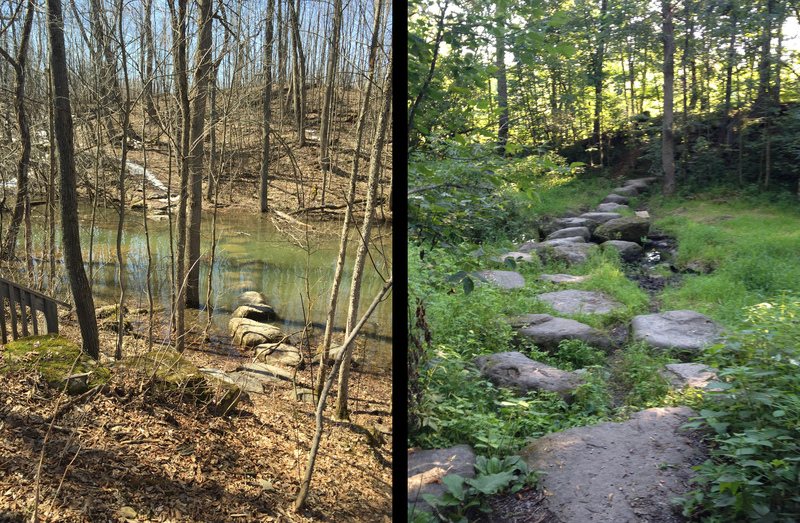 We had hoped to ford the stream that runs through Gaffney Park at another spot closer to the Rideau but the walking stones were completely submerged. It’s a great short portage in dryer seasons. Our return journey also took us further down the Rideau River along a path that goes under the fabulous Vimy Memorial Bridge. 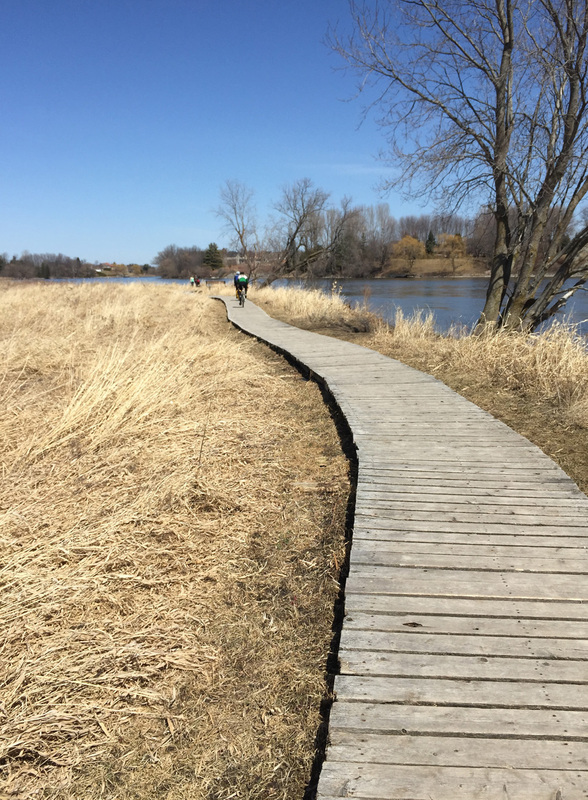 On the north side of the bridge the path turns into a wooden boardwalk that weaves it’s way through the Chapman Mills Conservation Area. Lots of pedestrians on the boardwalk so be prepared for a slow leisurely pace through this area. 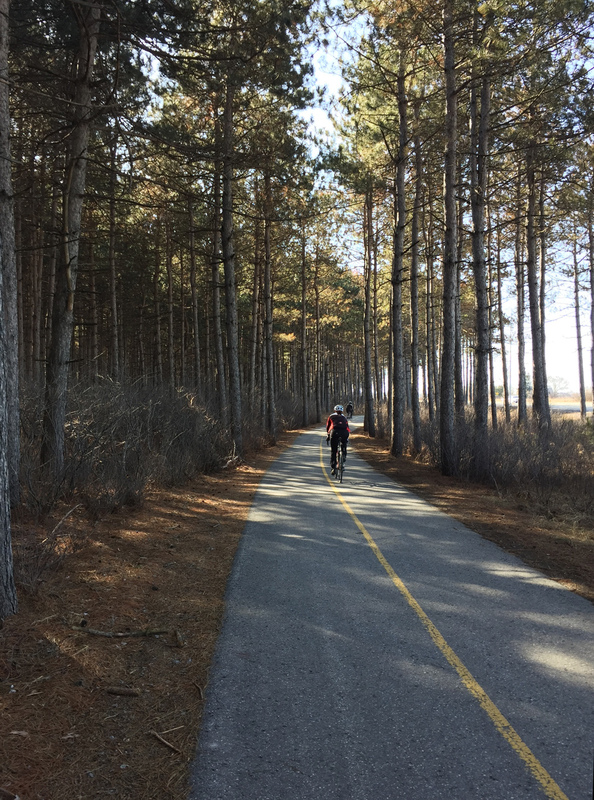 We pedalled along quiet Winding Way before cutting inland through quiet residential streets and parks before joining up with the bike path that runs along Woodroffe Avenue. We parted company with Heather and Chris at West Hunt Club Road, which seems a fitting spot to sign off. 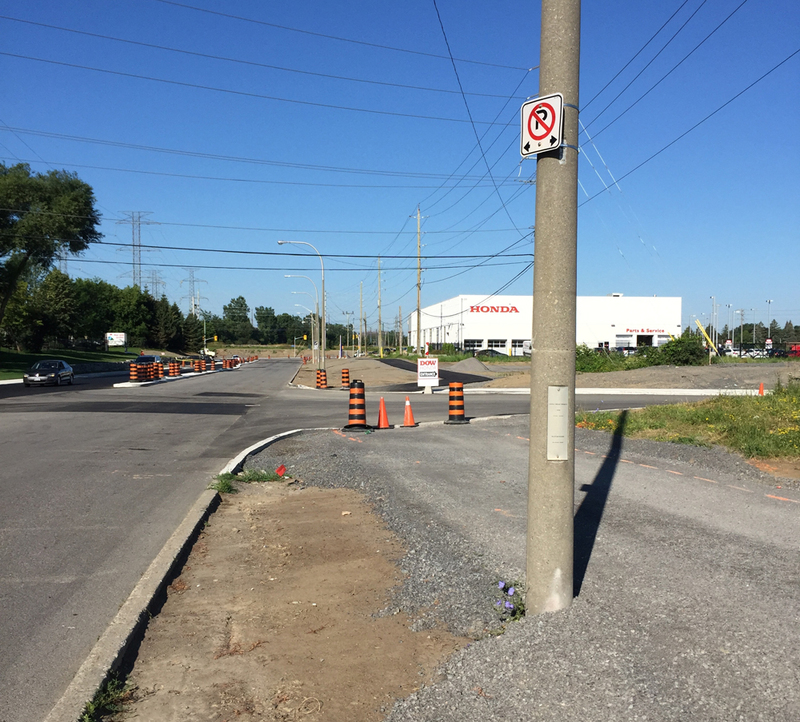 For an alternate route to Manotick that runs along Prince of Wales Drive heading out of Ottawa and back on the east side of the river, click here.